A few days ago I browsed through a couple of long threads on the SHA forum. * They were started by someone who felt he needed to do something to show how unhappy he was with the owner of Birmingham City. That seemed to strike a chord with a lot of people and there were numerous comments; a lot of people thought a flag would be a good idea and had various suggestions on what the flag should say. Needless to say, some of the suggestions were rather rude and one wondered how long fans would be allowed to display a flag that was deemed to be offensive. 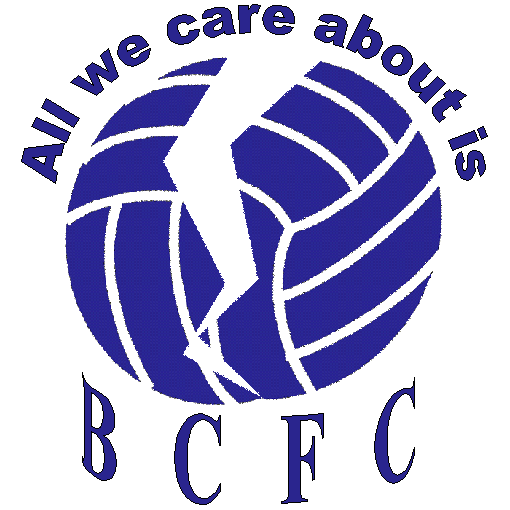 I have seen one suggestion that might get round that problem, which was to use the slogan “All we care about is BCFC”. It doesn’t mention the owner of our club but, because it’s a quote from an anti-owner song, it does imply the disdain fans have for him. I can sympathise with those who feel the need to protest though I don’t think anything we fans do here in Birmingham will make any difference to our club’s directors. But there are other things a protest might achieve. It could be therapeutic for fans to express their anger and grief. It could also show any prospective buyer that there are fans that care about the club. There is danger in protest too; any protest that turned violent could deter potential buyers. I know that an online poll doesn’t prove anything apart from the number of people willing to waste time answering polls. But just for fun I’ll include one. Just supposing someone produced some scarves with “All we care about is BCFC” in white letters on a black background (black to signify mourning) what would your reaction be? Of course, the only reliable way to test this idea would be to make the scarves and try selling them. This entry was posted in Birmingham City FC, Football and tagged Birmingham City F.C., Football on September 10, 2013 by Puddleglum. Would they be sold for cost or would a profit be made and given to the Blues Trust? Slogan idea ‘ the fans want our club back’, or ‘FA don’t protect our clubs’, or ‘Bham Council fail BCFC’ or simply ‘Sell our club’. This idea didn’t come from Blues Trust but in a PM from someone on a message board, someone I don’t know personally. The slogan and idea for scarves or T shirts was his; I suggested the colour black because I think it would be good to have a colour that stood out as different to the usual blue. I like the idea of a scarf because it’s something fans could choose to buy to show their feelings. The idea would either catch on or it wouldn’t. If it caught on the protest would belong to the fans who joined in and wouldn’t be just something organised by a few people. Anyone who wants to use the idea is welcome. How about the colour for the campaign being black and blue, after all the owners are kicking us black and blue. Like, we care about BCFC around our badge. How about car stickers for outside stans and scarves for inside? Carson, time to take a haircut? The colours I would use would be red yellow and black, based on the 1970s blues kit (similar to Man Utds protest). The colours are complete contrast to blue and white and during live TV matches / highlights would stand out to commentators and viewers highlighting the fans feelings nationwide. A slogan that could be used at home that is a symbol to anyone who supports blues, but could not be removed by the stewards and away, the same slogan plus a few beefy other comments about the owners on a large flag maybe. I believe Blues game with Bolton is live on TV. If it was how about a plane fly over the ground with a protest banner. The TV would show it and the owners could do nothing about it. It might get national press and the people on SHA who were looking to do the Chinese editorial would have some good photos and comments to use. Do not know how much these things cost or how to organise it, but it would make an uncomfortable afternoon for the owners to view wherever they are.